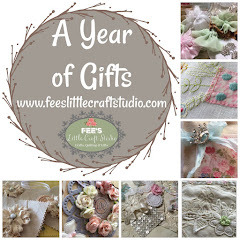 Fee's Little Craft Studio: ATGT Pattern Released + Floss Storage + Shame ! 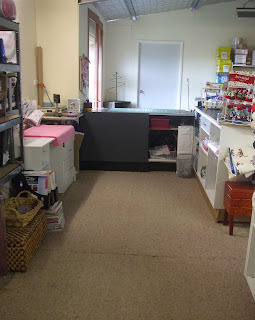 Today is my turn for a FREE pattern release on the Among The Gumtrees Blog. 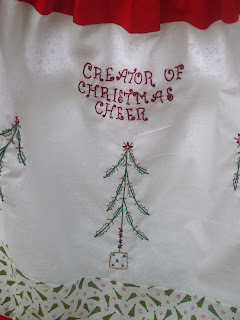 I have designed an Apron for the silly season called "Christmas Cheer". Go to the Among The Gum Trees Blog to download the FREE pattern. Says it all I believe - The heart of the home is in the kitchen especially at Christmas. 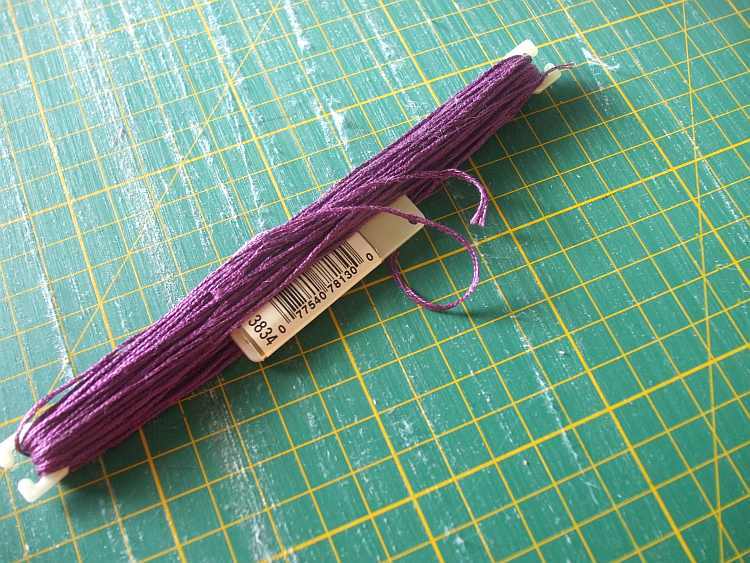 Now for a question - How do you store your embroidery floss? 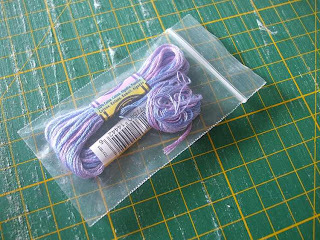 I have used many methods - I started off with my floss on numbered cards stored in a plastic box. I then purchased a DMC Bag with the plastic sleeves and bows like the one above. Until I had too many threads and then I couldn't do up the zip...... So I then resorted to storing some in little zip lock bags like this. But have now decided to revert back to the old system that I was using - That will be my job over the next few weeks to get them all back into some sort of order and onto cards. Now for the shameful part of this post. The Among The Gum Trees Girls are a fantastic bunch and we all get along like life long friends (or sisters as we like to call one another). There are always lots of e-mails each day to one another, Lots of group hugs and just general every day chitter chatter. 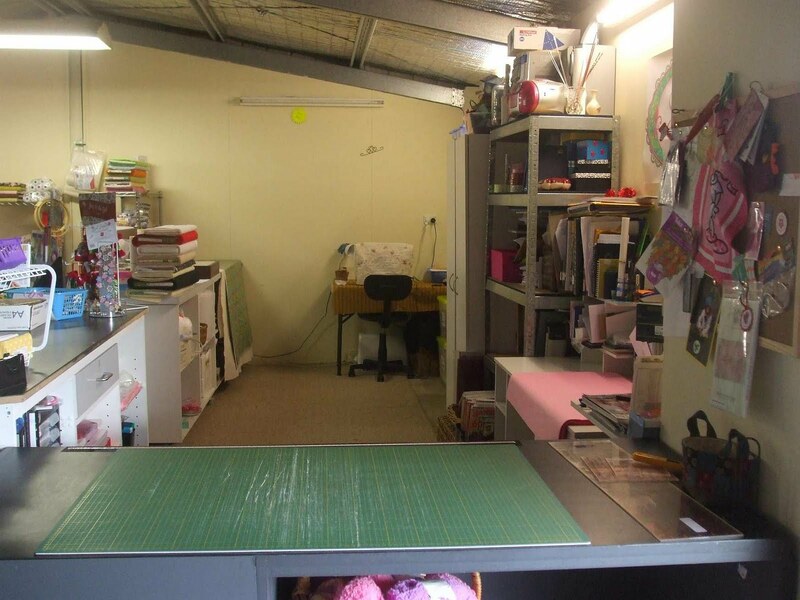 Yesterday Cheryl challenged us all to photograph our "creative space" without cleaning up and to share the pictures with our other sisters. 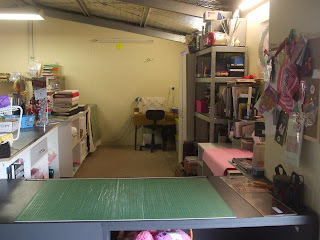 I knew that my studio was messy but boy I saw it in a new light after looking at those pictures !! So I was shamed into tidying up. I will not be able to show you the "BEFORE" photo's - Little gremlins popped into my computer and deleted them **BIG GRIN** but I can show you the "4 HOURS LATER" photo's. 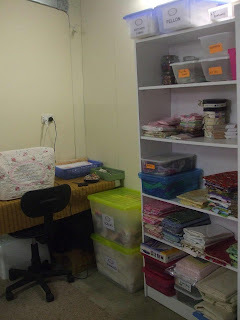 This is standing near my ironing table and sewing machine looking back at my cutting counter and desk. And my Sewing Table and fabric shelf. I now have tubs labelled where I can file things - Wonder how long that procedure will stay in place? My Ironing and light box table. 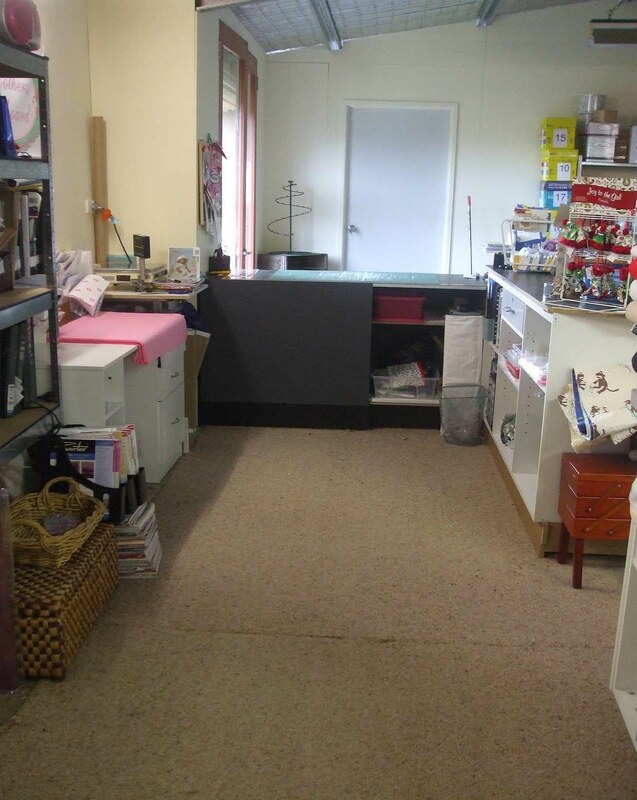 Yes this has been tidied up - Believe it or not !! I am sure that I will be much more creative in this tidier space. 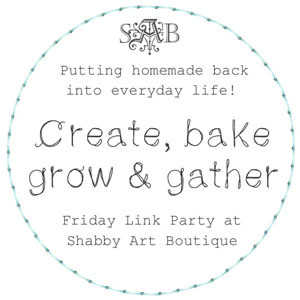 I am grateful to be shamed into action !! 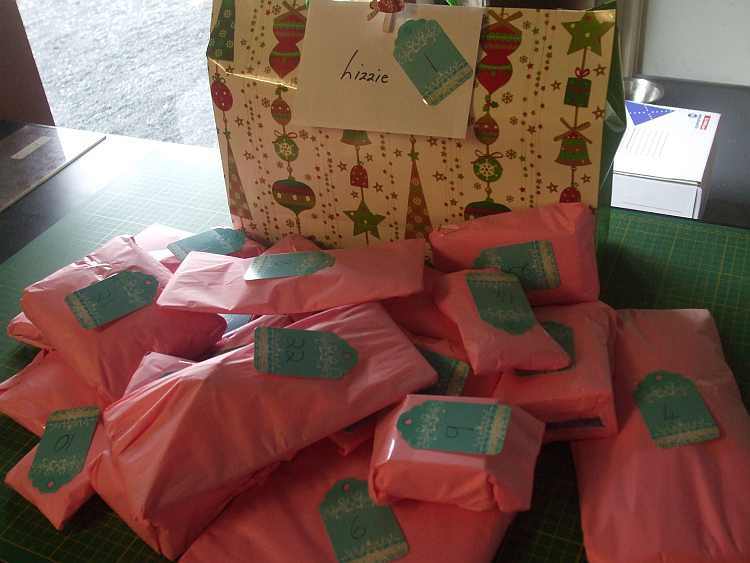 Finally here is a photo of the goodies on their way to my lovely advent swap partner Lizzie. 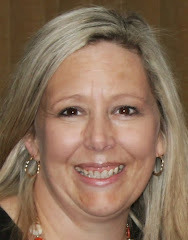 I have received so many lovely e-mails about new friendships made throughout this swap. It is so lovely to hear about them. I am really looking forward to seeing all of the little pressies opened each day - It will REALLY be Christmas for us all this year !! My Jan. 22 post shows how I store my floss. It is the 2nd and 3rd picture in that post. Hope this helps you. I sort them by number in color groups. Like Green from the lowest number to the highest then brown etc. It works for me. I cut the cardboard they are on many years ago and just put the number in the top corner. I use the plastic cards with stick on numbers. I carry the unused numbers in my purse so that when I start a new project I can tell if I have all the colors or not. 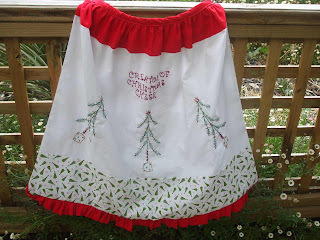 Fiona I adore the apron pattern and I can't wait to make one [or 6]! Thank you dear girl for such a delightfully cheery pattern! 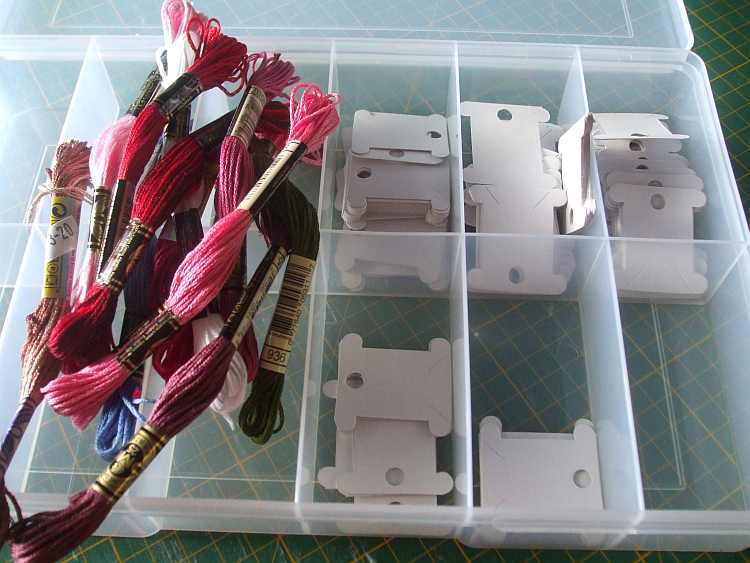 I too store my floss on the cards, in plastic boxes for that purpose - I'm afraid to try anything new, lol. This seems to work best for me! Your studio is incredible - and when it's messy, it's just creative genious at work! You're an artist, not a maid, right? *G* I figure if I tell myself that often enough, I'll start believing it. Thank you for this apron pattern.I only have one believe it or not. So this will be a gift to me. Again thank you. Now take it easy. You would not want to see my craft room!!!!! Thank you so much for the apron pattern Fiona. It will be most handy on Christmas Day!! The apron is toooo pretty to wear and get dirty, so lucky I can wear mine on the day and look efficient and helpful and not get it soiled. 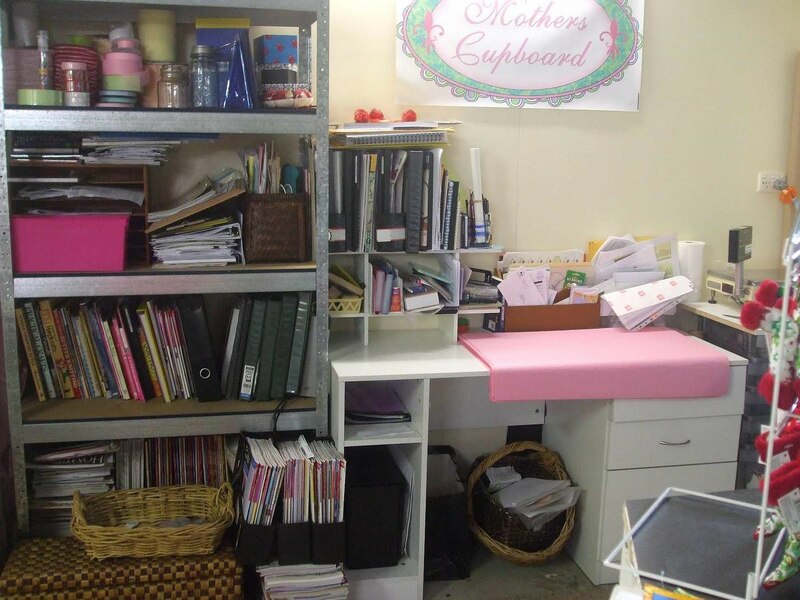 My work area is much more untidy than yours and I mostly know where everything is. Fiona,thank you so much for this pattern. This one I am making for me, well maybe a few for gifts at some point. Hi Fiona! Thanks for the free pattern, it's so lovely! My advent swap partner, Kim, received my swap, I'm very happy!! Now I'm waiting for my box!! First, I love the apron pattern, going to do one for my first grandchild, who has made me a great-grandmother twice now, grin. As to the floss, I use the cards and boxes that you are going back to, have tried other methods, but love this one, so organized, so neat, so easy to find the right floss. Thank you for the apron pattern, love it!!! The stitcheries are always fabulous and fun. I finally gave up on trying to wrap my floss on cards and I tried snack sized baggies in order in boxes. Now I just pile it all in one large basket to view the colors. I'm in the midst of reorganizing my room, again. I actually enjoy doing it, it keeps me knowing what I have!! Super pattern Fiona, many thanks! I really love the apron pattern. Thanks so much! Hola, Fiona! MUCHAS GRACIAS!!! El delantal y su diseño es hermoso! Y la verdad deberíamos estar lindas también en la cocina para esa fecha, no? Eso es prestar atención a los detalles! Felicitaciones! Yo guardo mis hilos de bordar en cartones como los de su foto. Aquí no consigo los plásticos que Uds. usan, pero yo los copio en las cajas de cereales, así de paso reciclo y ordeno!!!. Su espacio de trabajo está PRECIOSO! Valió la pena el esfuerzo! Que tenga una gran semana! Un fuerte abrazo!!! 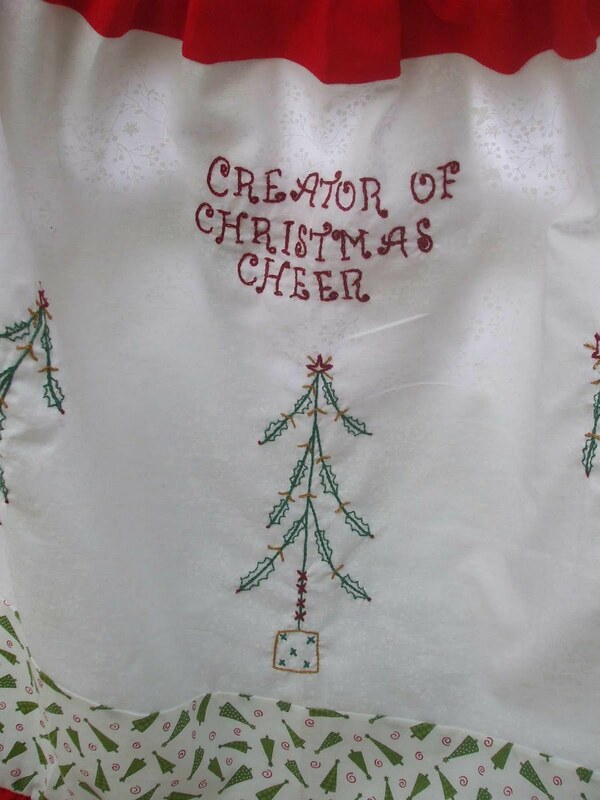 Thanks you for the pattern for apron; my granddaughter will love. 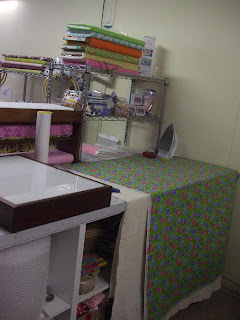 I store my floss on cardboard things and also on the plastic long bows, especially pearl cotton. Sweetie your space looks fantastic! The before photos weren't that bad sweetie... although the one with the Xmas elves wrapping up Lizzie's parcels... well they did make quite a mess didn't they?! thanks for the apron pattern. Ideas for storage/organization are much needed.